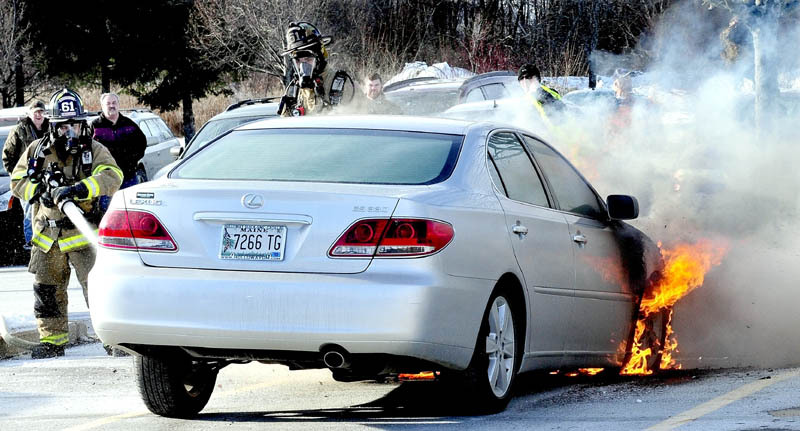 Waterville firefighters extinguish a fire that destroyed a 2005 Lexus sedan parked at Marden's Surplus and Salvage, at 458 Kennedy Memorial Drive in Waterville, on Monday. Owner Lucille Roberge of Waterville said the car, which she recently purchased, was insured. "I came out of the store from shopping and said to myself that someone's car was on fire, before I realized it was mine," Roberge said. "I loved that car."